What is it? Aquatic therapy, in general terms, is therapy provided in water. More specifically, aquatic therapy is a customized water program designed and monitored by a qualified professional provided to a variety of individuals. It is beneficial in jump starting a therapeutic plan of care for individuals who may not tolerate a land-based program initially, whether that be due to pain, muscle guarding, weight bearing status, etc. How does it work? The principle of buoyancy is an upward pressure provided to an object in water2. The principle of gravity counteracts the force of buoyancy on an individual in water which allows for decreased weight bearing through the joints and decreased force through the body2. Conversely, on land, 1 pound of weight can make a large impact on the force through the joints of the body. For example, “did you know that 1 pound of weight puts an additional 4 pounds of pressure on knees”1. This is one of the reasons why aquatic therapy is beneficial. The degree of weight bearing in water is dependent on the degree of immersion. For example, an individual has approximately 10% weight bearing in neck deep water and approximately 50% WB in waist deep water2. This principle of decreased weight bearing is one of the most beneficial effects for many populations of individuals. Other benefits of aquatic therapy include muscle relaxation and body awareness provided by the warm water. Also, the drag created by viscosity in water provides a form of resistance training in itself without having to add external resistance such as ankle weights2. How can we help? 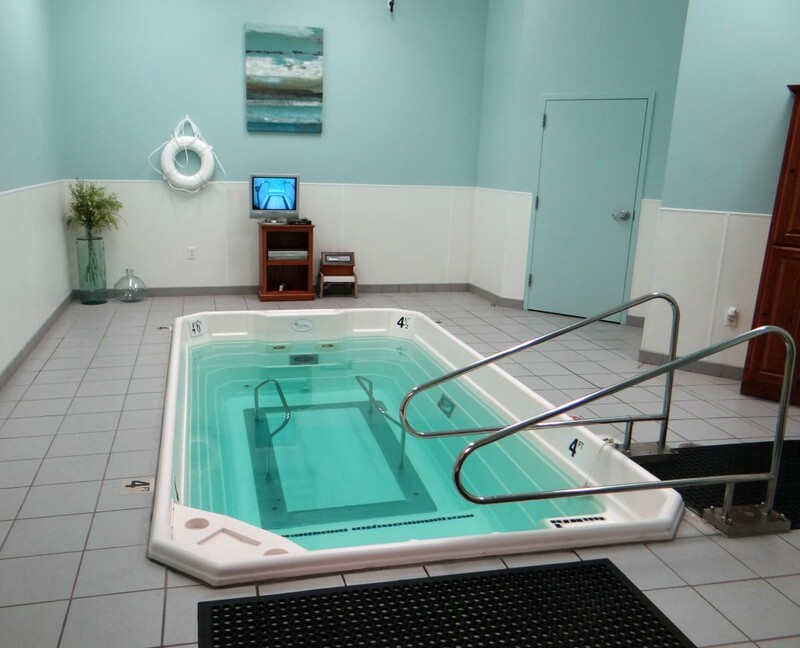 ApexNetwork Physical Therapy has several locations that provide aquatic therapy under the supervision of a qualified therapist. These locations include: Belleville East (IL), Highland (IL), Maryville (IL), Frontenac (MO), and University City (MO). Our pools are all heated pools which provide a warm, relaxing environment for added therapeutic benefit. If you, a family member, or friend believe you would benefit from aquatic therapy please get in touch with us at one of our providing facilities! We would love to help you! Pfizer Inc. Weight Management. Arthritis.com. http://arthritis.com/arthritis_diet. Published 2013. Accessed June 23, 2016. Cole AJ. Becker BE. Comprehensive Aquatic Therapy. 2nd ed. Philadelphia, PA: Elsevier; 2004.